Start with the wrapper. In a bowl, combine flour and rice flour. Add boiling water and oil then mix quickly with a fork. Use your hands to form the dough into a ball and knead it until it is smooth and elastic. Cover with plastic wrap and leave it on the counter for 30 minutes. While the dough is resting, mix all the stuffing ingredients in a bowl. Use your hands to blend the mixture until the meat becomes sticky. Divide the meat mixture into 24 even pieces and roll each piece into a small ball. Set aside on a baking sheet. Roll the dough on a floured surface into a long log and cut into 24 pieces. Keep the pieces under plastic wrap or a kitchen towel. Take one piece of dough and roll it into a 3-inch circle. Put the wrapper on your thumb and index finger and put one of the small balls of meat on top. Slowly push down the shu mai into the hole between your thumb and index finger to wrap the wrapper around the meat ball. Push the edges of the wrapper inward in small folds covering the top edges of the meat. Some meat at the top should remain exposed. Put the shu-mai on a floured plate or tray and cover with plastic wrap. Continue this process for the rest of the dumplings. Before steaming, tap some water around the folded edges of the wrapper with your fingertips to help keep them from drying out. (If the wrapper is still moist already, skip it.) 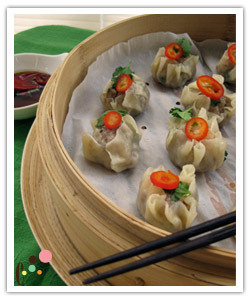 Steam the dumplings in a steamer on high heat for 6-7 minutes. Take one piece out of the steamer at the 5-minutes mark to confirm the meat is cooked through. When they are cooked, garnish the top with fresh red chile and cilantro leaves. Mix all ingredients for the dipping sauce and serve on the side with the shu mai. Other condiments such as sweet chili sauce or soy sauce are good to serve with them as well.